With pitchers and catchers reporting it’s a day to wax poetic about the beginning of baseball…bla, bla, bla. I’m not going to do that, although it is a sunny beautiful day here in Mesa. Instead I’m going to blog about the story, before the story. This morning Cubs beat writer Paul Sullivan tweeted “Pitchers, catchers, writers, transcribers, sports anchors and TV cameramen report to Fitch Park this morning”, and so the media blitz is on, as it is every year at this time. However my friends, one intrepid Cubs fan/PA guy has been over at Fitch Park on a regular basis for many weeks now, following the dedicated group of Cubs players at Camp Colvin. You have seen my pics and heard some snippets about what was happening here in Mesa. but it’s time for my Camp Colvin wrap report. For anyone who may not know the origin, the name ‘Camp Colvin’ sprang up from Tyler Colvin spending last year’s off-season (Nov. 2009 to Feb. 2010) in AZ working out. His routine included weight training, running, a special weight gaining diet, and even some mountain climbing. BOS was the first media (I use that term very loosely) anywhere to report Colvin’s 20lbs muscle gain (with pics) last January. Colvin wasn’t the only player to work out here in AZ last off-season, but his results, followed by a 20 HR rookie season earned this years off-season group the name Camp Colvin. For Tyler’s part, he isn’t taking the name too seriously. When I asked him about the moniker “Camp Colvin”, he said he thought it was “funny”. The term has been the source of some amusement down here. When Randy Wells showed up a few days back he told Tyler that it was ‘an honor to be invited to Camp Colvin’. I also heard ‘Camp Barney’, shouted across the diamond a few weeks back when Darwin Barney (who is vying for the Cubs 2nd base or utility infielder role), made a nice play. 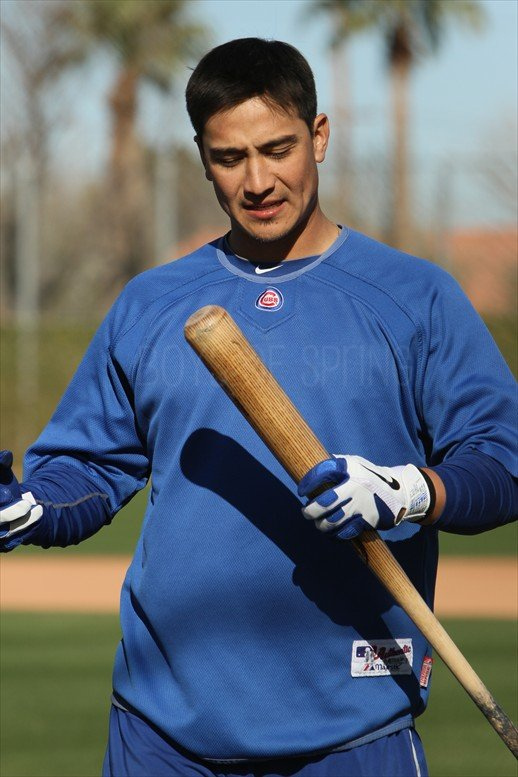 Speaking of Darwin Barney he really had a beneficial off-season here, adding 18 lbs to put him closer to 190 lbs after playing at about 170 at the end of last season. While watching some batting practice’s I noticed Darwin’s added strength giving him more pop with the bat (although he will likely never be confused with a power hitter). 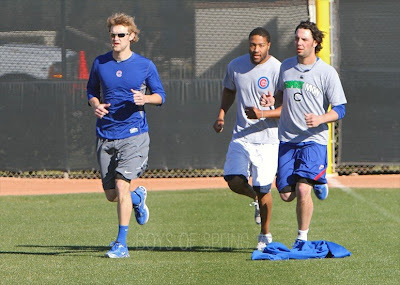 Barney is part of a dedicated group of Cubs organizational players who worked extremely hard this off-season. 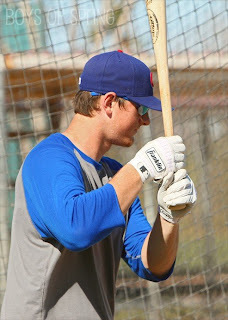 One of the other players showing big results is DJ LeMahieu the second round pick for the Cubs in 2009. LeMahieu has added 19 lbs this off-season to his 6’4” frame . This is a very good thing because LeMahieu can hit, I bet he’s never hit below .314 for a season in his lifetime, although I haven’t checked his T-Ball records. Cubs Director of Scouting Tim Wilken said a while back that he thought DJ would eventually develop power to go with his natural line-drive swing. So it will be interesting to see if the added weight ups DJ’s power numbers this coming year. 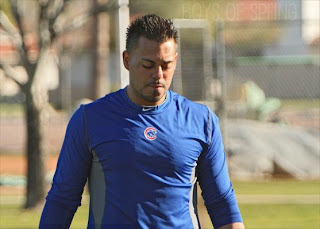 DJ has been a middle infielder playing college ball at LSU (2009 College World Series All-Tournament team) and was at second base last year with the Cubs A+ Affiliate in Daytona. LeMahieu is a player to keep your eye on, as his added strength could eventually make him a future candidate to shift to third base. LeMahieu isn’t a spring training invitee like former first round pick Josh Vitters who has also been here working hard this off-season. Vitters didn’t have any big weight gain but does look stronger this spring. Vitters has the power in his bat but needs to improve on last season’s .223 average at Double A Tennessee. Vitters is 21 years old and been in the Cubs system for 4 seasons, this is a big year for him to show the Cubs they made the right selection as the third player picked in the first round of 2007. The Cubs don’t want to rush Vitters and likely feel he needs a season or two more in the minors before he’s ready. I wrote a blog (Aug. 11, 2010) during last season before Mike Quade took over about the direction of the Cubs organization, comparing them to the Minnesota Twins. Now it looks like we are seeing some evidence that the Cubs may be leaning that direction. Case in point, one of the early coaches to show up last week in Mesa was Brian Harper the former Minnesota Twins catcher who helped them win the World Series in 1991. Harper will be the Manager for the Cubs Double A-Affiliate Tennessee Smokies this season. What I like about Harper being in the Cubs organization, is that when he played, he was one of the most difficult players to strike out in the American League averaging one K per 25 plate appearances. Harper finished with a career .295 average over 16 MLB season’s. Watching Harper at Fitch, he showed a natural ability to communicate with players. That should translate nicely to a minor league setting like Tennessee where a Manager gets more hands on work with the ball players. I’m guessing Cubs Assistant GM Randy Bush who played for the Minnesota Twins in both World Series winning years of 1987 and 1991 had a hand in bringing Harper on board for the Cubs. I would be remiss if I didn’t mention Tyler Colvin when talking about ‘Camp Colvin’; Tyler is back healthy after his scary incident that cut short his 2010 season. Colvin works as hard as anyone and looks stronger than ever coming into this spring. 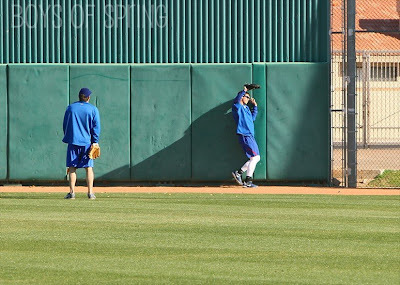 It will be interesting to see how Mike Quade handles the outfield this season. The Cubs need to play the best players in order to win, and that doesn’t always mean the guys who make the most money. I don’t know the exact number of players working out here during the off season but it was well over 20 (minor leaguers included), and many others have come in early to get a jump start on spring training. This is an incomplete list but these guys have been the boys of winter (if you can say Phx has a winter) or showed up early to camp – Ryan Dempster, Jeff Stevens, James Russell, Andrew Cashner, Justin Berg, Jeff Samardzija, Darwin Barney, Tyler Colvin, John Grabow, John Gaub, Scott Maine, Koyie Hill, Geovany Soto, Marlon Byrd, Randy Wells and many more minor leaguers besides those profiled earlier. I’m sure I’m forgetting to mention someone, so I apologize in advance. Camp Colvin is done and it’s on to spring training and the “official” beginning to another year of Chicago Cubs baseball. 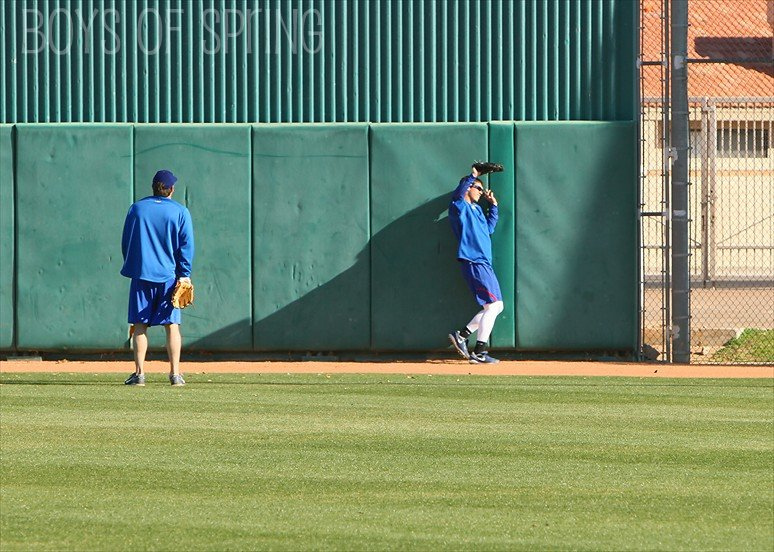 The first workout for pitchers and catchers is tomorrow and I’ll have all the photos for you here at BOS. Cubs baseball, it’s a new year!